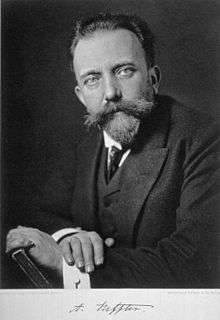 Arthur Carl Wilhelm Heffter (15 June 1859, in Leipzig – 8 February 1925, in Berlin) was a German pharmacologist and chemist. He was the first chairman of the German Society of Pharmacologists, and was largely responsible for the first Handbook of Experimental Pharmacology. He isolated mescaline from the peyote cactus in 1897, the first such isolation of a naturally occurring psychedelic substance in pure form. In addition, he conducted experiments on its effects by comparing the effects of peyote and mescaline on himself. Arthur Heffter (1898). "Ueber Pellote – Beiträge zur chemischen und pharmakologischen Kenntniss der Cacteen Zweite Mittheilung". Naunyn-Schmiedeberg's Archives of Pharmacology. 40 (5–6): 385–429. doi:10.1007/BF01825267. Arthur Heffter (1896). "Ueber Cacteenalkaloïde". Berichte der deutschen chemischen Gesellschaft. 29 (1): 216–27. doi:10.1002/cber.18960290145.